The round concrete picnic table is constructed of precast concrete reinforced with steel and a powder-coated steel frame. This concrete picnic table is durable and is truly a table perfect for any setting. 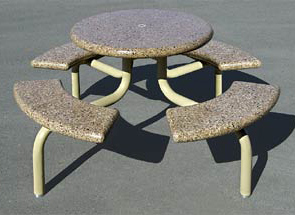 These round concrete picnic tables seat eight people. Also available in a 3 seat universal access model. This ADA compliant universal access round concrete picnic table functions perfectly as a wheelchair accessible picnic table while maintaining the durability and sleek design of precast concrete. Some assembly required. Available in multiple colors shown below.